This post is, by way of leftovers, a follow up to Beer Brined Pheasant. My most recent repeat of this recipe worked very well using Badger Blanford Flyer and Brains Barry Island IPA to create the brine, admittedly I used these beers because I had no interest in drinking them as they’re too sweet for my tastes. We enjoyed our roast brined pheasant with Hardknott Dark Energy, there’s a proper synergy between a stout and a roast in my opinion. Dinner used a breast and a leg each – the rest of the meat was stripped off the carcass and along with a creamy textured roast potato was used for the recipe idea presented in this post. This post is also, by way of chance, suitable for “Saint Patrick’s Day“. The recipe celebrates the passing of the winter by enjoying the last of the game season’s pheasant – and welcomes in the spring by way of fresh young nettle tops and wild garlic. 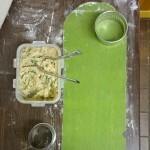 Using the latter green ingredients a green pasta is made – green, the colour of Ireland. One can imagine the timing of Saint Patrick’s Day probably has at its roots the celebration of spring. Like many people around the world “I have an Irish [insert ancestor]” – in my case grandmother. However I never met her and have no cultural links to Ireland and have never particularly partaken of the global piss-up that Saint Paddy’s has come to be known as. Take this recipe as you will, homage to Saint Patrick or to spring – my preference lies to the latter. 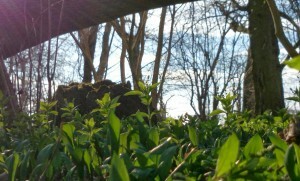 On Saturday March 15th we visited a local woodland known for its sea of ransoms – aka wild garlic. We found it to be just coming up, but plenty there to gather a couple of handfuls. 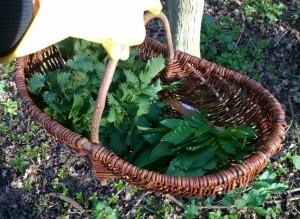 We also gathered nettle tops. Enjoying the general pleasantness of early spring – warmer temperatures, woods still clear of difficult growth, with violet and primrose blossom forming colourful highlights on the woodland floor. The making of the pasta is as for a spinach pasta – use your favourite recipe but use nettle tops and wild garlic leaves in place of spinach. 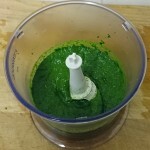 I used 65g of de-stemmed young nettle tops and 35g of wild garlic leaf. 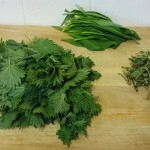 Two litres of water on the boil with two tablespoons of salt in it, I’ve read that the salt helps the leaves retain their green colour – blanch nettle tops for 1 minute, placing wild garlic leaves in when there is just 15 seconds of the minute left. 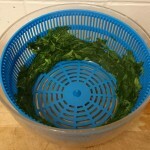 Pour leaves into a strainer and press out as much liquid out as you can. Pop into a little food processor with one whole egg and emulsify to a bright paste. For the pasta start with 500g of good plainflour and one teaspoon of salt. Rub in the green paste. 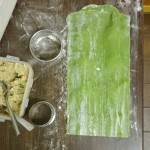 Add egg until a stiff dough is formed – a good pasta dough starts off pretty stiff and difficult to work. In addition to the green paste my dough used one more whole egg plus the yolks of five eggs. This came together using wet hands and was kneeded for a good 15 minutes on a dampened benchtop. Wrap in clingfilm and place aside at room temperature to relax for at least an hour. To make the filling finely dice a small onion (~100g) and sauté in a teaspoon of oil. When translucent add the stripped pheasant meat and fry for a couple more minutes to heat. Add a glug of dry white wine or hefeweizen and let this bubble for a minute. Pop the contents of the pan into a small food processor. Add the white of one egg and one creamy roast potato (~100g - also leftover from pheasant roast) and blend to a smooth paste. I then had to had two tablespoons of breadcrumbs to make the paste a little more workable. 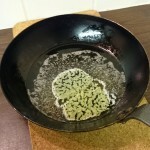 Stir in 100g of fine-grated rich but not astringent cheese – I used an extra mature gouda – and a tablespoon full of finely sliced wild garlic leaf. Season to taste with salt and pepper. Pop this paste into the fridge until you are ready to make your pasta parcels. Make the parcels however you like. 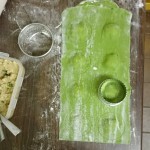 I chose a ravioli form as it is pretty simple to make. 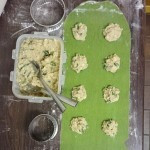 Using my pasta roller to roll a handful of dough at a time. I’ve done this using both my thinnest and second from thinnest settings and both work, the thinnest is a little harder to work with and some ravioli may bust whilst cooking – but the result is lighter and more delicate. Fold the pasta in half to find the centre point, note it, unfold. Use a cutter to lightly mark circles into the dough (at the thinner end if there is one). Put just a teaspoon of filling into the centre of each circle. Mark around each bit of filling with a damp finger if your dough seems dry. 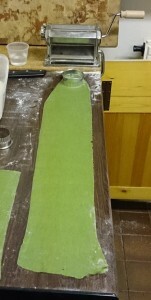 Fold the pasta back over and carefully press out air pockets. Use the blunt end of a smaller cutting ring to press down the dough and then the sharp end of a fluted cutter to cut out the ravioli. Place on a floured surface, semolina “flour” is preferable. You can make and freeze these in sheets which when solid can be put into freezer bags. To cook from fresh plunge into salted boiling water for just three minutes – I call seven or eight of my ravioli a good serve. I also cut a few pasta offcuts into rough linguine which went in for just the final minute. 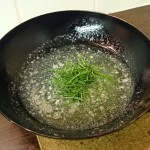 At the same time melt a generous tablespoon of butter per serve in half a teaspoon of warm oil. 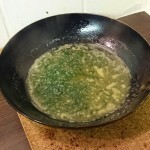 When the butter is melted and just barely bubbling toss in a teaspoon per serve of finely sliced wild garlic leaf, sizzle briefly, add a glug of white wine of hefeweizen, bubble briefly, then bring off the heat. 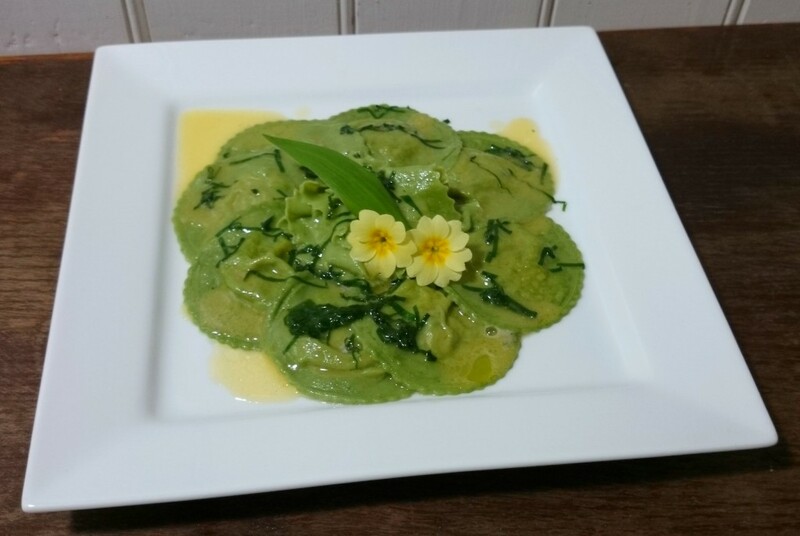 Strain out your ravioli and toss in the wild garlic butter. Beer match?! Getting into the Irish spirit is pretty difficult with beer – as we see little good Irish beer in England. I used to be partial to a Guinness but find it a bit thin and flavourless by my standards these days especially when stupidly “extra cold”, albeit Guinness is still my default in mainstream pubs with no good beer. Guinness, or any dry stout, isn’t going to work with this dish anyway in my opinion. Ireland does have a rapidly growing microbrewing scene that seems very interesting but alas I’ve had no experience of its output. However in Tesco you can buy a couple of Franciscan Well beers, Friar Weisse and Rebel Red Ale – both well rated for their respective styles on RateBeer. (Yes, they’re owned by Molson Coors… whoopy doo – drink the beer not the company…) I popped into a local Tesco and picked up a couple of each to try with the pasta. 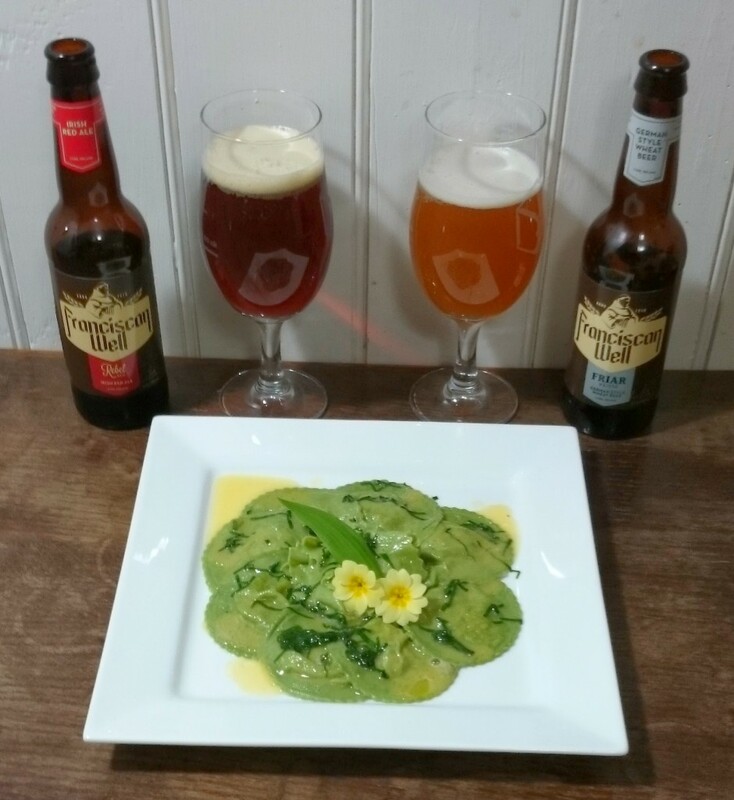 I think both work well enough but I had a preference for the Friar Weisse – it was complementary to the soft buttery flavours of the ravioli dish, with a cutting lightness and freshness. The other advantage of the Friar Weisse in this context is a glug of it can be used in the buttery sauce instead of the white wine – I did this the second time around when I had the beers to hand and it worked very well. The Rebel Red Ale by comparison just added too much an extra strong layer of flavour at odds with the food. Were I eating with wine this is to me most certainly a white wine dish – a soft Italian white perhaps. Serve with beer, of course. Something Irish for St Patrick’s Day. 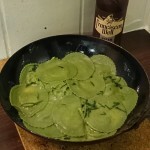 This entry was posted in Cooking, Food Matching, Recipe and tagged Franciscan Well, Friar Wheat, Irish, Nettles, Pasta, Pheasant, Primrose, Rebel Red Ale, St Patrick's Day, wild food, Wild Garlic by Yvan Seth. Bookmark the permalink. What an interesting website Yvan. Good luck in your new venture. Dave. Head Brewer – Over The Hill Brewery!